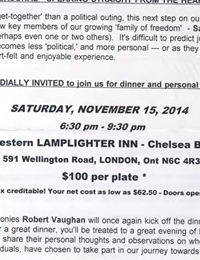 On November 15, 2014, Freedom Party held a dinner in London, Ontario at the Best Western Lamplighter Inn. 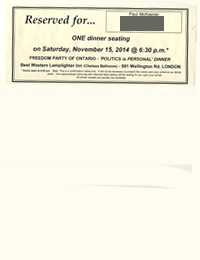 The theme of the dinner: Politics is Personal. After MC Robert Vaughan gave Freedom Party’s traditional toast to freedom, Robert Metz and Paul McKeever presented Clare Maloney (2014 FPO candidate in the riding of Elgin-Middlesex-London), Salim Mansur (2014 FPO candidate in the riding of London North Centre) and Liz Bendell (long-time Freedom Party member and supporter) with Freedom 200 pins for their service to the party. Metz followed the awards with a discussion about the importance of making a commitment to freedom through a commitment to Freedom Party. Next, Al Gretzky provided highlights from his experiences during and after the 2014 election. Salim Mansur discussed the fall of politics into the election of unqualified celebrities, and the importance of the sovereignty of the individual. FPO leader Paul McKeever explained how and why enemies of freedom attempt to make politics appear impersonal when actually, it is quite personal. Robert Vaughan then gave a closing comment before attendees mingled. Arnon Kaplansky unwittingly appears in the closing scene of the video.